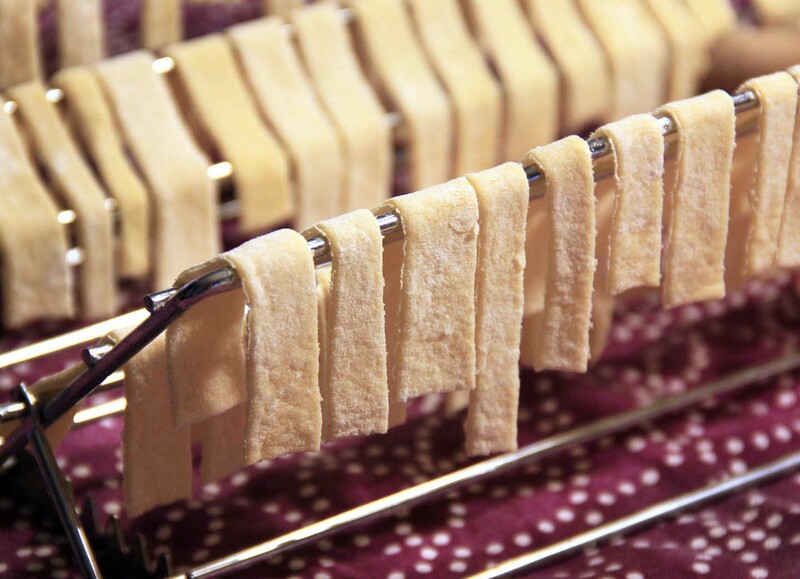 Making one’s own pasta is incredibly easy and takes any chunky, homemade soup to the next level of deliciousness. Make my own pasta? Wasn’t that something gourmet foodies did in the 1990s with esoteric shiny home pasta machines and haughty Italian cookbooks? Well, yes. But humble folk in myriad countries have been doing it by hand for, oh, maybe thousands of years. It isn’t as hard as we tried to make it in the 90s. Plus homemade egg noodles are super yummy in chicken noodle soup. Break the eggs into a bowl. Add the flour and salt. Mix until well-incorporated, then knead on a floured board, adding flour if necessary. Roll out very thin, cut into desired shapes with pizza roller or a sharp knife. Allow to air dry for several hours. Violà. Remove all the meat from the chicken and dice or shred meat, set aside. Discard the skin. Place chicken bones in a large stock pot and fill with water to several inches above the bones. Add bay leaf, one peeled and quartered onion, one celery stalk with leaves, and one carrot. Simmer for at least an hour. Strain stock and add the vegetables, chopped, the coriander, salt and pepper, and chopped fresh parsley or crumbled dry parsley to taste. Simmer for at least 30 minutes, then add desired amount of chicken and simmer 10 more minutes. Add dry egg noddles and cook till soft, 5 minutes or less. So good, you’ll want to take a sick day off just so you can make it. You’ve inspired me; I’m going to give it a try. But what is that fancy thing the noodles are drying on and if I don’t have one of those, do you have other suggestions? It’s an adjustable roasting rack, but use anything you’d like. You can probably let them dry on a regular cookie cooling rack. Have fun!